This project study is all about converting a handbook into an android application which is the researchers’ solution in preserving the handbook in a way that it will not be torn easily and protect it from water during rainy season. An android based handbook which is accessible anytime and will be installed on android devices. 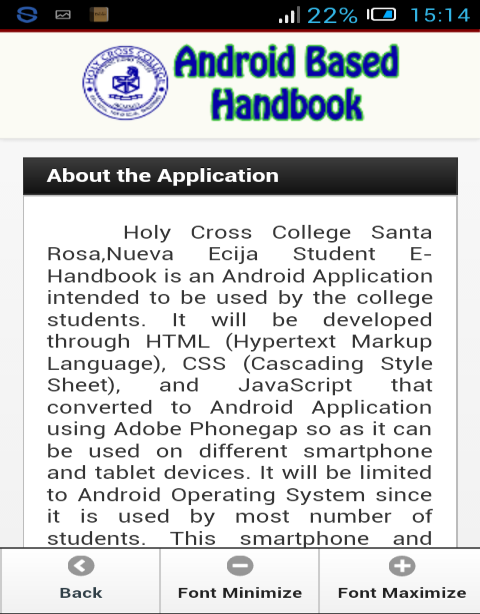 At the end of the study we were able to create an android application for our school’s college department which outlines student rights, privileges, and responsibilities and provide information about how to get help with appeal requests, processes and procedures, and resources available from school system personnel. Computer technology, internet and web-based resources are now in many schools and offer teachers and learners vast resources and opportunities for teaching and learning. In the context of this study, a computer technology resource is used as a general term referring to any computer, internet and web-based resource that can be used in the instruction. This eLearning project is an online-based classroom management system. The system can be installed in a standalone computer, in local area networks or even accessible via World Wide Web. The researchers used the waterfall approach model in developing this system wherein the development team goes ahead to the next stage of development, only after the previous stage is fully accomplished.